Guantanamo Bay detainees will have a harder time seeking their freedom in court after a federal appeals court ruling. Washington (CNN) -- Accused foreign terrorists and war fighters in U.S. custody will have a more difficult time challenging their detention in the wake of a key ruling Tuesday by a federal appeals court. A three-judge panel concluded "wartime detention" limits the rights of foreign prisoners captured on overseas battlefield. The case involved an appeal by Ghaleb Nassar al-Bihani, a Yemeni captured in Afghanistan and held since 2002 at the Guantanamo Navy Base in Cuba. "Requiring highly protective procedures at the tail end of the detention process for detainees like al-Bihani would have systemic effects on the military's entire approach to war," wrote the judges. "We believe the government's argument stands on more solid ground." 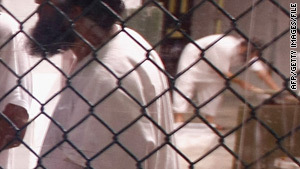 The ruling will serve as a template for future such appeals by other Guantanamo prisoners. Al-Bihani was described as a cook who fought in a paramilitary brigade allied with the Taliban, which had been challenging Afghan and U.S. led coalition forces in the days after the 9/11 attacks. He denies receiving al Qaeda terrorist training and ever firing a shot in battle. Al-Bihani and the rest of the so-called 55th Arab Brigade, which included al Qaeda leaders, eventually surrendered. Al-Bihani was handed over to American forces in early 2002. He was sent to Guantanamo for interrogation and incarceration. With the help of lawyers, al-Bihani filed in federal court a so-called "habeas" petition, contesting his detention as not permitted under international law. Writing for the court, Judge Janice Rogers Brown said the president's power to wage war and detain captured fighters was proper under the Constitution, and was not limited by international law. The ruling is important because it will serve as a controlling guide for dozens of similar appeals pending in federal court in Washington. Al-Bihani has the option of asking the entire U.S. Court of Appeals for the District of Columbia Circuit to review the case, or challenging the ruling at the Supreme Court. In the meantime, he will remain in military custody indefinitely. The White House announced Tuesday it was suspending sending any Guantanamo detainees like al-Bihani back to Yemen. That decision came in the wake of last month's attempted airline bombing near Detroit by an accused Nigerian with reported ties to al Qaeda leaders in Yemen. Brown and her colleague, Judge Brett Kavanaugh, went further in their views than the Obama administration had originally argued in the case. In a separate opinion, Brown said federal court authority to review similar habeas claims is "unsettled" and that federal judges may not be fully prepared to handle them. "In the midst of an ongoing war, time to entertain a process of literal trial and error is not a luxury we have," she said. "What drives these issues is the unconventional nature of our enemy: they are neither soldiers nor mere criminals." Brown did say Congress reserves the power to create new habeas standards for courts to follow, following a 2008 Supreme Court decision. The so-called Boumediene ruling two years ago by the justices created a constitutional right for foreign fighters held overseas to challenge their continued imprisonment. The high court however, did clarify the limits of that right. Lower courts have since been at odds trying to navigate what Brown acknowledged was "legal uncertainty that clouds military detention." The positions of Brown and Kavanaugh appear to mirror the strict stance taken by the previous administration. Both judges were named to the bench by President George W. Bush. The third judge in Tuesday's ruling, Stephen Williams, was named by President Reagan to the court, and said while al-Bihani could be held, the ruling went unnecessarily beyond what was required under existing law to deny the appeal. The case is al-Bihani v. Obama (09-5051).